An innovation management program must deliver results. The implementation of ideas is therefore a critical aspect to build into your program, so that the output is measurable and impactful. Fast track process - Not every idea needs to be turned into a sophisticated project. You can select quick wins for implementation right after the idea generation phase, and migrate them into the concept phase. Instant concept and project creation - Not every concept or project needs to be based on an idea - create solutions directly as new concepts or projects and start mapping out the business case. Agile innovation projects - An iterative phase-gate process adjusts to the requirements of your project team. Develop ideas further - Investigate and develop ideas that are not yet ready for implementation. Customize the process - Quickly and easily build your own templates to be used for concept development stages, such as a business case, or a business model canvas. Run detailed evaluations - Analyze the opportunity and offer closed group discussions for a team of subject matter experts. Track decisions - The decision-making process throughout the concept phase is tracked in detail. Tracking progress - Assign tasks to project team members and create milestones to track progress. Keeping an overview - The powerful innovation pipeline explorer offers you an overview of your project landscape, including a deep search capability. Build a portfolio - The ultimate goal of an innovation program is to build a pipeline of potential innovations. HYPE brings it all together into a single place, from ideas to projects. Handing over - Most companies have a dedicated project management system. HYPE’s RESTful API makes it easy to seamlessly integrate and handover projects between the systems. 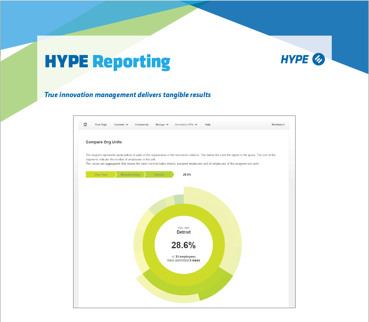 Real-time figures - HYPE’s KPI dashboards give you the latest figures at a glance, with one-click export to Excel or another format. Drill down reporting - Clickable table cells allow you to dive into the aggregated data, down to the level of the individual ideas behind it. Supporting your presentations - Compile your presentations for management using branded, PPT and Word reports. Custom charts - The KPI engine allows you to build your own charts, displaying combinations of data from across the entire system. As always, one-click exporting is available on all charts and tables. Download our brochure and learn more about our approach and features to support your reporting needs! We make software that helps companies connect people with ideas, to drive innovation and transformation forward. Please keep me posted on Hype’s latest new product features and innovation management insights.